Aquarius and Cancer are both wonderful people with some challenging differences in their characters that make them difficult to get together in long term. Cancer are more personal in their approach while Aquarius a very open and friendly. They have to go through a few adjustments to make their relationships work. Cancer are very determined and money minded people. They love to work for their pay cheques (checks) and equally respect moral values and family. Cancer are capable of expressing almost all the types of human emotions with grace. Their love for the chivalrous and noble elegance makes them happy. Cancer are very intelligent and cautious regarding every matter of personal and professional life. They are highly valued by people for their subtle and compassionate nature. The trouble is, sometimes they mix up their moods, and one then has to observe when they are funny and lovable, when they become nostalgic, or become aggressive. Cancer might get quite obsessive about secret matters and can go to great lengths in order to guard their secrets. They cannot appreciate people who don’t respect time and money. Aquarians are rebels in nature and do not like to follow the conventional norms laid down by the society. They can be quite stubborn and even though they have no qualms with accepting change, they do not easily make changes in their opinions and do not support hypocrisy as well. Aquarians are social butterfly with many friends and acquaintances. They are very true to their words and only say what they mean. Also they can see the past, present and future all in one. Aquarius are able to ball all of these things into one and achieve great results. Aquarius people are well rounded and extremely intelligent. They enjoy long term relationships but more in friendly way rather than bonding to the norms of that relation. Although not a straightforward match, then, the chances for this relationship to succeed long term are cautiously optimistic. A shared sense of purpose is key, although both partners must be careful they don’t end up more like brother and sister than lovers – keeping the passion alive here could be tricky. With some effort from both Aquarius and Cancer, compatibility is certainly possible – and when these two combine their caring instincts, who knows what might follow? Set up an institution for orphans in a third world country and both of you will be blissfully happy! According to the Cancer, Aquarius are quite helpful. Cancer are known for their pragmatic attitude towards life but even they are prone to change, and people can find it hard to understand them completely. The Aquarius might get perplexed by the changing moods of the Cancer. Aquarians can be considered quirky, because they like to throw surprises on the Cancer, but throughout, the former always gives a slight hint about the upcoming adventure. Every now and then the Aquarius like to spring a surprise on the Cancer because they are very hell-bent on the concept of privacy. Since the Aquarius do not like to hide things from their partner, they find it difficult to understand the Cancer’s need to maintain secrets. Both of them need to take a break and rejuvenate through a vacation when they feel that it is getting difficult to deal with each other’s quirkiness. The Cancer cannot appreciate the inquisitive nature of the Aquarius because it coaxes them to divulge too many details about themselves and the reserved attitude of the Cancer who feel very uncomfortable in such a situation. 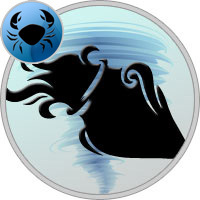 The unpredictability associated with the Cancer might annoy the Aquarius and they can have a tussle because of their different temperaments. There are times when both of them try to dominate each other. The Cancer try a lot to coax the Aquarius to follow their lead, but their efforts may not bear any fruits, as the Aquarius can be adamant too. But there are instances when the Aquarius give in to the demands of the Cancer so that harmony is maintained in the relationship. Financial security also matters a lot for the Cancer, and whenever they are depressed they can cheer up with the thought of having a lot of money to fall back on during the hard times. Cancer may have a rough time working out with Aquarius in some relationships while the others may just be as fun as possible. Like being friends, siblings, relatives and colleagues is always fun for both of them as they both have good humor and a helpful heart and so even in long term they can work well together rather in a friendlier manner than expected. Business cannot be such a good idea for these two especially with different values for money but since they both love success they can give it a try. Marriage and love relationships can be a little more difficult for them as they have different expression of love but with time they can grow together in real best and supporting friends. As parents Aquarians are again more of the friends with their children which makes their relationship very smooth in the family and Cancer have the protective way of taking care of little ones. With the growing relations between Aquarius and Cancer, even problems can grow to some extent. The Cancer can easily feel lonely, and during these times the Aquarius should lend their support and take the Cancer down the memory lane, when everything used to be hunky-dory. If the Aquarius wants their relationship with the Cancer to grow then they should pamper them with immense love and attention. The Cancer should make sure that they do not nag the Aquarius with too many questions because it might make the Aquarius feel too claustrophobic and irritated in the presence of a Cancer. The Aquarius can be absent minded sometimes, and the Cancer can act as their guiding light and help them to focus on the task that is of topmost priority. Aquarius are sometimes termed as selfish because they do not give a second thought about other people and at such places the Cancer can help them to find a path which fulfills both the needs. The association of marriage between a Cancer female and Aquarius female is a result of strong attraction towards each other. He loves her sense of humor and is allured by the charisma of her personality. He gives her all the freedom and support that she desires. She also makes all the efforts to strengthen their bond by nourishing the underlying bond of friendship. He is one man who naturally learns to deal with the mood swings of the Cancer lady. He is a social animal who loves to go out and make new friends and to keep their relationship going; she needs to accept his social outings. He may not be a romantic partner to her as for him companionship is more important. He doesn’t like any kind of interference and questioning as far as his life is concerned but he always intrudes her privacy thereby making her irritated and upset. He must understand to respect her personal space. He also makes constant efforts to keep their relationship interesting and lively by giving his lady wonderful surprises. With time, their bond gets stronger as they are able to understand and accept each other. They are able to look beyond differences and enjoy each other’s company to the fullest.